How do we learn about nature? 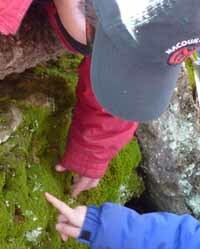 Very small children discover the parts of it they can reach. They notice what the rest of us take for granted, everyday things like shadows. They feel shapes and textures (to their occasional discomfort) and they taste things. Overwhelmingly, school-aged children find themselves being told the sum of what other people already know: teachers talk, textbooks have to be read, and existing internet content has to be used as a source. The best learning comes through a combination of all that, plus genuine discovery (because not everything is known yet) and questions (because there may be a different and better way of looking at things). Macoun Club leaders have to work very hard to stay ahead of such active and inquisitive members as we have in our group. Here’s how we do it. “In the field” means outdoors. Wild nature itself is our greatest resource. Our group has all-day field trips every second Saturday where kids are forever asking “What’s this?” and the leaders keep doubling back to see what they missed. The leaders, and some members, have their own field trips even more often, and then they can be quiet and observe more effectively. The Macoun Field Club’s library index. Macoun members who look up an interesting subject can borrow the book. If you’re not in the Macoun Club, you may be able to find the same book in your local library. The Fletcher Wildlife Garden, where we meet, also has a nature library, and Macouners have borrowing privileges there, too. More new books and articles appear every year than we can afford to buy in Macoun Club, so the leaders either borrow them from a public library or buy them for ourselves, and relay what we learn to the group. Most of us who want to know things have our own field guides. Identifying Land Snails and Slugs in Canada: Introduced Species and Native Genera, a 2009 book or CD that can be ordered free from the publisher, the CFIA, by phoning 1-800-442-2342. It’s land snails made easy, but slugs are another story. We ask scientists and other specialists to make presentations to our group. 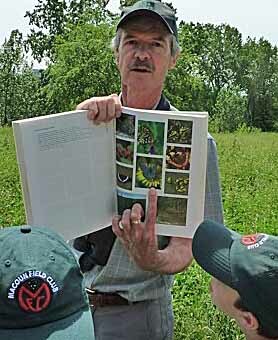 We find terrific people in Ottawa’s naturalist community, its universities, museums, and government agencies. The internet: What is this? Tell me more! What do I do with an injured wild bird or turtle? More and more, we turn to the internet for what we want. Since we write our own webpages, we know that information can be wrong from the start, or become dated. We think we have found some pretty good sites. Revised and posted in this new place Apr. 4, 2012. Additions made at intervals, most recently Nov. 7, 2014. All photos by Macoun Club participants. Coding revised again in May, 2016.